You know when the main roads and interstate jams up in your home town? Not to worry you just take the back roads to avoid the traffic, Right? The same is true for Walt Disney World Parks. 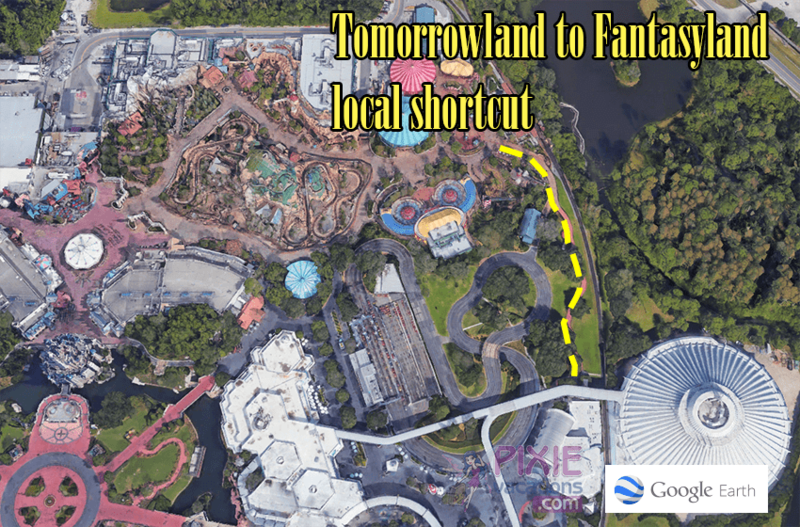 There are hidden back routes and paths in each Walt Disney World park that the locals use all the time to get from one side of the park to the other. 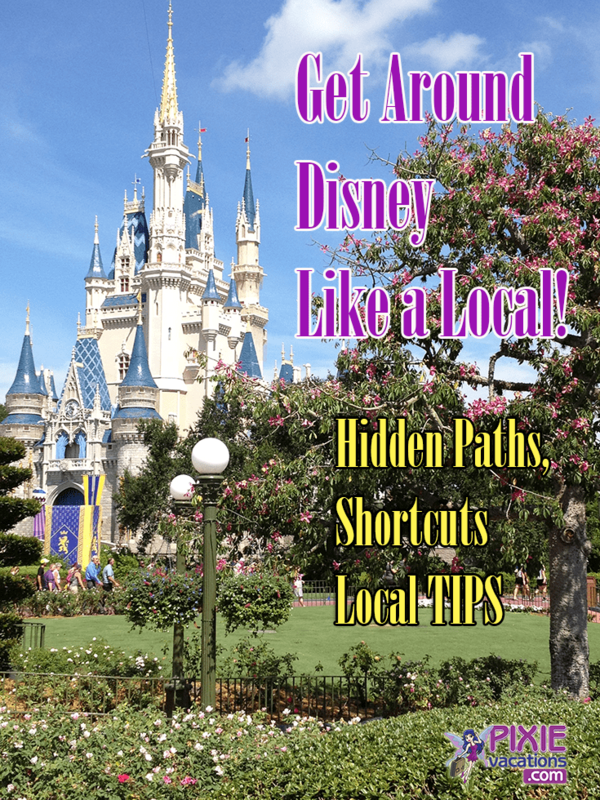 If you want to get your fit-bit steps in, don’t worry you will get plenty of that at Disney World, but these shortcuts will help you beat the crowds and make you look like a Disney Pro to your friends. I am going to start with the four main Disney Parks and then as a bonus cover some of my favorite way to get around Walt Disney World property from park to park. Sound Good? Let’s head over to the Magic Kingdom. When the Magic Kingdom Parade or Fireworks are over it’s a tad congested walking down Main Street USA. The best way to get out of the park is to enter at KC Juniors and walk though the main street shops all the way until you exit the Emporium. You have to dodge people shopping but it’s faster then walking on Main Street. During Peak Times TIP: Disney will also open a backstage exit during high peak crown periods. This runs on the other side of Main Street USA and goes from lower Tomorrowland to the front of Main Street USA. You will see castmember directing you to use this backstage path only when it’s open to the public. Insider Disney Pro TIP: Instead of racing out of the Magic Kingdom with the masses I like to hang back and do my gift shopping or just enjoy the park for another 30 – 45 minutes to let the crowds die down. It also makes the bus or monorail ride back less crowded and nicer. This hidden path at Disney’s Magic Kingdom is one of my local favorites. When you exit Space Mountain and want to get over to Fantasyland without the crowds, take this red colored path. This pathway is also perfect for photos and for some great shots of the Disney World railway. Also during special events like Mickey’s Not So Scary Halloween Party there is sometimes a trick or treat candy spot or three on this pathway and it’s a perfect path to gather up loads of Halloween treats. 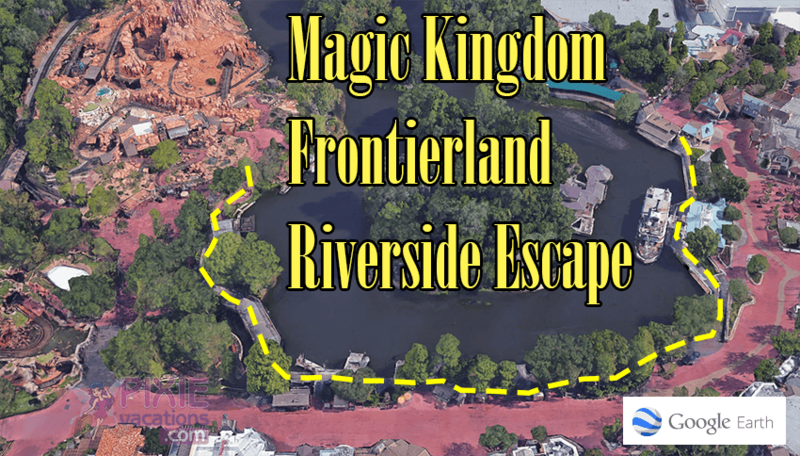 You can also take this pathway to the Fantasyland railway station or stop at the restrooms on the Fantasyland side. Please Note: This brings you through a smoking area. The Magic Kingdom has a spoke design that lets you get to each land and back to a central point. This is great and a theme park innovation. 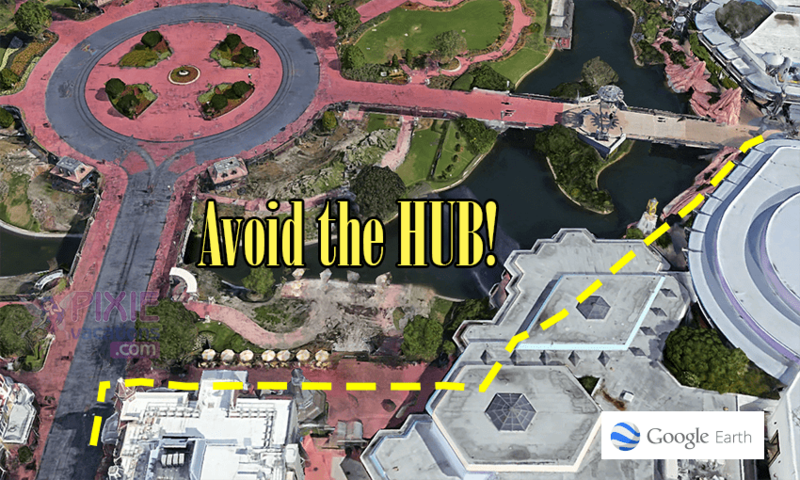 But there are times when a castle show, parade, or fireworks are going on that you might want to avoid the Hub. The Hub area has nice grassy areas to hold larger crowds but still cutting around the Hub to the Right takes you to Tomorrowland (See the map). Or cut to the Left by KC Juniors and past the Crystal Palace to get to Adventureland. 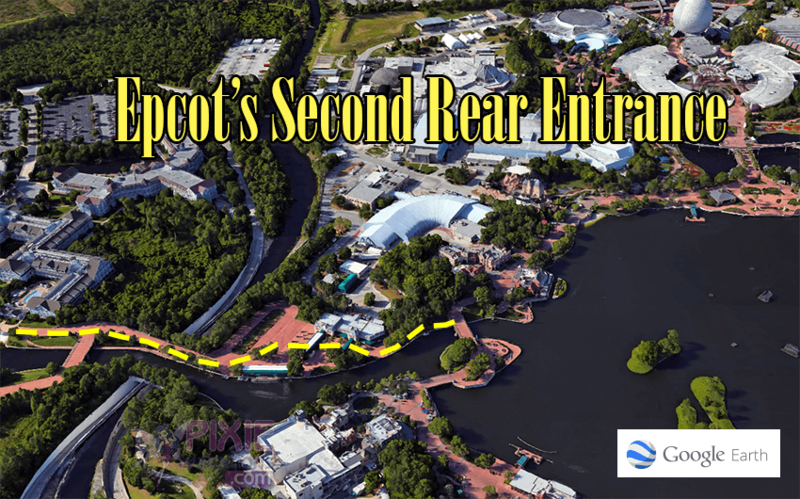 Insider Disney Pro TIP: These pathways still can get crowded before Once Upon A Time, the nighttime spectacular, starts. Castmember’s will keep the crowd moving and it’s better than going into the Hub. This is another fantastic way to beat the crowds in Frontierland at the Magic Kingdom. This path is also seldom used and it takes you from the Haunted Mansion to Big Thunder Mountain. You can get on and off at most any point along the way. I love to take this path during a parade to avoid the crowds and still make your way from one side to the other. The path also has nice scenic views of Tom Sawyer’s Island. Local TIP: Use this path to get around the Summer time Splash Mountain Crowds. The area around Splash Mountain can get very congested but you can avoid that by taking this water walkway. These two passage ways let you quickly go from the Wild West to Adventureland. Also a hidden bonus is that you can grab a Dole Whip at the far left passage way on the map above. The longer passage way also has restrooms. 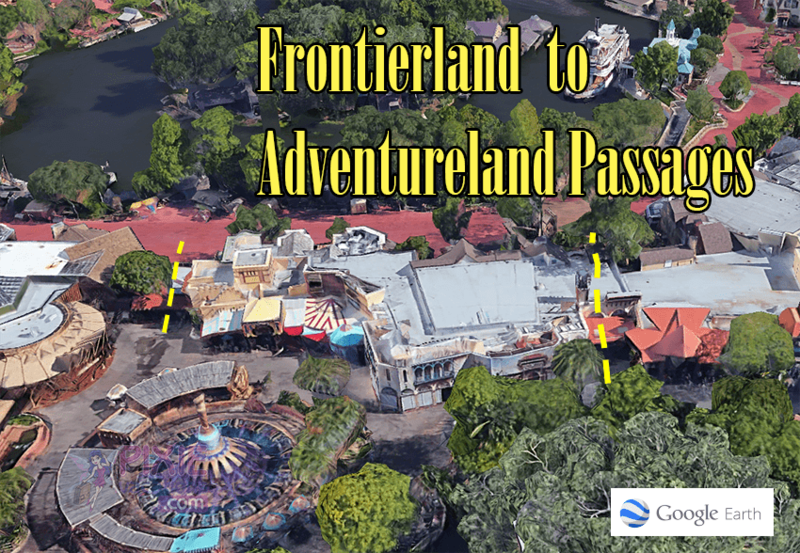 If Adventureland is crowded I often use these passages to get to Frontierland without having to walk all the way to Pirates of the Caribbean. These come in very handy when you want to quickly get out of World Showcase and back to the front of the park. 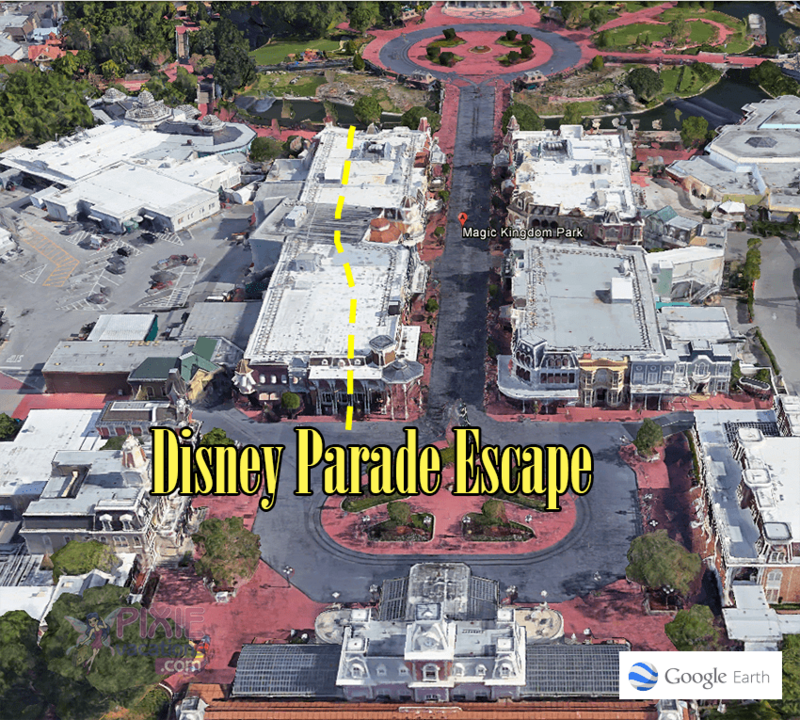 The pathway on the right of the map goes past the old Odyssey Restaurant. This pavilion is used for special events sometimes now and this path is almost always pretty empty making it a great way to get over to Test Track for your Disney Fastpass reservation. This is also a great way to get out of EPCOT after Illuminations, but I have an even better secret exit I’ll share with you in the next map. 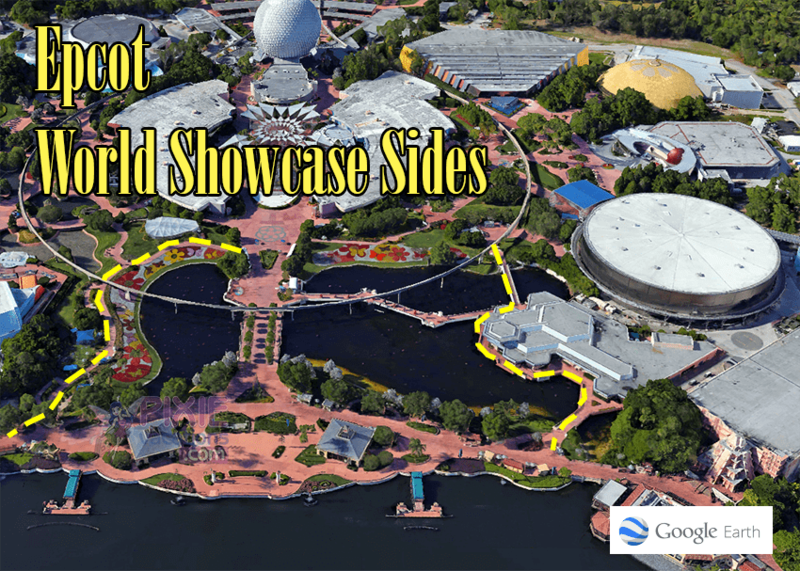 The path to the Left on the map is the old Epcot Rose Garden Path. This is also not heavily used unless there is a Food and Wine Festival and sometimes during the Flower and Garden Festival it will have a few people using the pathway. This is the best kept secret at Epcot, so don’t tell anyone else. I love to stay at one of the Walt Disney Epcot Resorts because you can walk or take the Disney boat to Epcot from your Disney resort. The Disney Beach Club, Yacht Club and also Disney’s Boardwalk Inn are all steps away from Epcot. This second entrance is located between the UK and France. Disney Insider Pro TIP: Here is what you do. Book an Epcot Disney Resort for part or all of your Disney World Vacation and have your travel agent also book some nice dinners at Epcot for you. You get to enjoy your Disney resort and at night walk over to Epcot and eat dinner in Paris, watch the fireworks and when it’s over you are literally back in your room in ten minutes. There is no Epcot crowd to fight. It’s heaven. There are other ways to avoid Disney crowds and that is what our Disney World Crowd Calendar does. What is a Disney Crowd Calendar? We worked with Touring Plans to put together the best prediction of Disney World park crowd levels. Touring Plans takes years of data they have collected from ride wait times and others data and events to predict Disney World crowd levels. This is very helpful when planning the best times to travel to Walt Disney World. You can download our Walt Disney World crowd calendar. It’s free. Pixie Vacations and Touring Plans have teamed up–check out Touring Plans’ awesome crowd calendar for up to date crowd projections. They have years of data and a full time statistician on staff. You can’t get better projections! Do you have tips on how to avoid the crowds at Walt Disney World? We would love to hear your crowd saving tips, please share them by leaving a comment. Become part of the Pixie Vacation Family!